Bridgewater not getting it done on third downs today: 6 of 10, 42 yards, INT. #Vikings are 4 of 10 when he drops back on third down. Cutler and Bridgewater have now matched overthrows on what could have been key plays. In Alshon we trust. 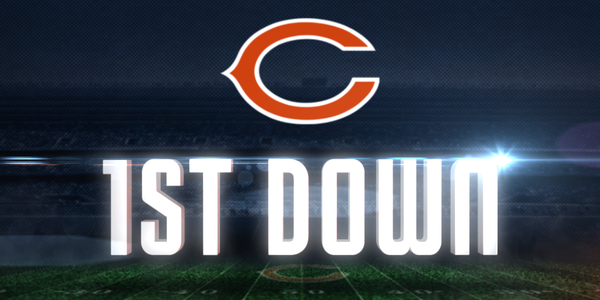 That's another #Bears 1st down! Meanwhile, Alshon Jeffery now has 8 catches for 100 yards vs. #Vikings , 7:45 left to play and #Bears are driving. Now we have an official injured in Chicago. Everson Griffen really wishing the Vikings bye week hadn't been so early. He clearly needs time to heal and doesn't have it. *******. You never ever seen Page , Marshall, or Eller ever get helped off the field! Dear Josh Robinson, I deeply regret the fact I've spent a year blaming you for not being able to cover Alshon Jeffrey. Cutler with the keeper, gets into the endzone and the Bears take the lead. Cutler's four-yard TD run under review after he collided with Harrison Smith at the goal line. Bears fans celebrate after the first replay on the scoreboard. The second look in slo-mo? They were less enthusiastic in their applause. I'm ready to WHINE on WHINELINE!! The Cutler Keeper at work - even after review! 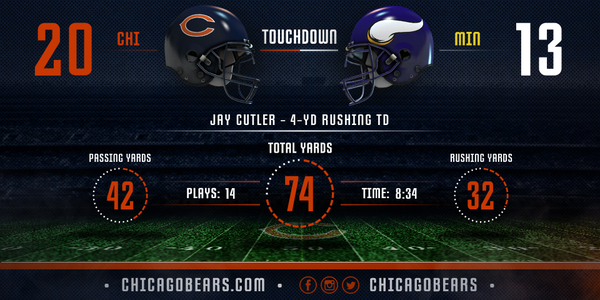 Call stands, #Bears take 20-13 lead on #Vikings with 4:55 left. Teddy Bridgewater gets another chance to bounce back. PAT gives the #Bears a 20-13 lead. 4:55 left in the game. Supposedly this was a running game plan today for the Vikings. It feels like a classic Frazier-era running game offensive day. I feel a TEDDY strip sack FUMBLE coming our way! Matt Forte will not return to today's game with a knee injury. PERNELL! 1st #Bears sack of the day.